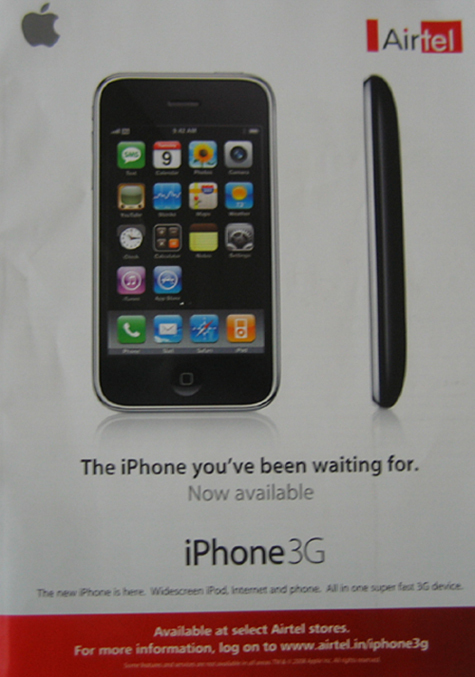 As both Airtel and Vodafone launched iPhone 3G in India last month, I thought that it would be an interesting marketing battle between Airel and Vodafone to attract the iPhone lovers. But till now I have seen the iPhone ads only by Airtel. Right from the day of the launch, Airtel started its Television commercials. I’ve also seen Airtel’s print ads in the Outlook Business magazine and their outdoor advertising in certain bus stops in Chennai. So what’s Vodafone doing? It’s busy marketing their matrimonial services as they have launched ‘Shaadi.com on Vodafone’. After all the pre-launch hype, as people find more reasons not to buy iPhone than to buy one, it looks like Vodafone is going slow on their iPhone marketing efforts. What do you say? Yes, in terms of iphone marketing Airtel is everywhere. I will just start the same debate in my community.